Blessed Sacrament is a great enough church to house two pipe organs. The original organ is a 1925, 3 manual, 50 rank Casavant Frères. This instrument is the work of the famed French Canadian organ builder, Casavant Frères in St. Hyacinth, Quebec. Frederic Fisher, of the automotive family which still funds its upkeep, donated it to the church in 1925. 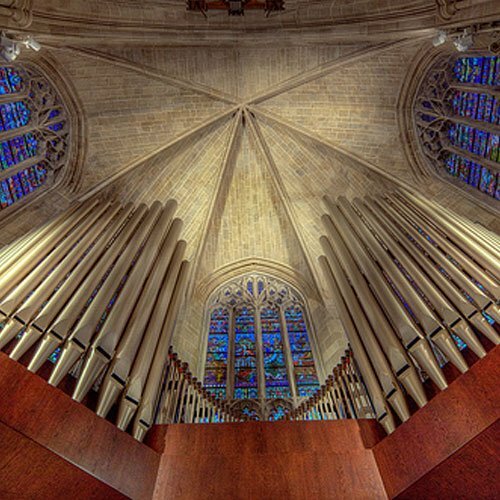 Its 55 stops of more than 3,500 individual pipes are hidden in chambers behind the stone walls of the choir loft. With warm voicing, thick expression shades, and broad scaling, this instrument is at its best when accompanying chants or playing compositions of the Romantic era. While the console has been renovated and updated with solid state memory, the pipework and action is to original specification. Casavant restored the reeds and mixtures using the original specifications in 2010. The Cathedral’s second organ was made in the United States. The Austin Organ was built in Hartford, Connecticut. This instrument serves as a foil to the Casavant, its brilliant choruses thundering down the central axis of the apse. The Austin Organ has 1,745 pipes and is composed of 32 stops capable of producing a large variety of tonal colors. The largest speaking pipe is about 23 feet long and the smallest about the size of an ordinary lead pencil. Both consoles have a blind general system, allowing the organist to play both organs simultaneously at one console. Together, these two instruments allow church musicians to convincingly play sacred music from many different musical eras. Rich and sonorous each in their own unique ways, the organs of Blessed Sacrament Cathedral fill its worship space with power and majesty.